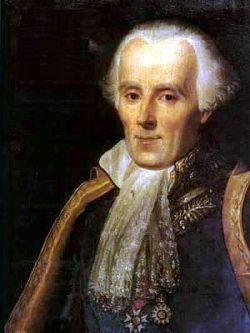 Pierre-Simon, Marquis de Laplace (March 23, 1749 – March 5, 1827) was a French mathematician and astronomer who conclusively demonstrated the stability of the Solar System and vindicated Isaac Newton's theory of gravitation by his imaginative solutions to mathematical problems. He contributed to the differential calculus, probability, and other fields of mathematics and was considered the most advanced mathematician of his day. He left many formulas and techniques that are of great utility to scientists and engineers. Pierre-Simon Laplace was born in Beaumont-en-Auge, Normandy, the son of a small cottager or perhaps a farm-laborer. He owed his education to the interest excited in some wealthy neighbors by his abilities and engaging presence. It is interesting to note that Laplace was at first engaged in the study of theology and was particularly adept at argumentation in that field. But his interests soon turned to mathematics, in which he found himself unusually proficient. By the time he was 18, he was given a teaching position in a college in his hometown, but, having procured a letter of introduction to famed French mathematician Jean le Rond d'Alembert, he went to Paris to pursue his fortune. D'Alembert, however, did not take kindly to Laplace's impositions and at first rebuffed them. But Laplace, not to be defeated so easily, wrote again to D'Alembert, discussing the principles of mechanics. This so impressed d'Alembert that he reversed his original judgment. "You see I pay but little respect to letters of recommendation," D'Alembert wrote back. "You, however, have no need of them. You have made yourself known to me in a more appropriate manner, and my support is your due." D'Alembert used his influence to secure a position for Laplace as professor of mathematics in the Military School of Paris. When he was 24, Laplace was admitted to the French Academy of Sciences, after which he threw himself into original research. In the next seventeen years, 1771-1787, he produced much of his original work in astronomy. This commenced with a memoir, read before the French Academy in 1773, in which he showed that the planetary motions were stable, and carried the proof to a higher degree of accuracy than had yet been attained. This was followed by several papers on points in the integral calculus, finite differences, differential equations, and astronomy. From 1780 to 1784, Laplace and famed French chemist Antoine Lavoisier collaborated on several experimental investigations, designing their own equipment for the task. In 1880, the two scientists published a paper, Memoir on Heat, in which they discussed the kinetic theory of molecular motion. They measured the specific heat of various bodies, and the expansion of metals with increasing temperature. They also measured the boiling points of alcohol and ether under pressure. During the years 1784-1787, Laplace produced some memoirs of exceptional power. Prominent among these was one read in 1784, and reprinted in the third volume of the Méchanique célest. In that, he completely determined the attraction of a spheroid on a particle outside it. This is memorable for the introduction into analysis of the potential, a useful mathematical concept of broad applicability to the physical sciences. Laplace produced a memoir presented in three sections in 1784, 1785, and 1786. He showed by general considerations that the mutual action of Jupiter and Saturn could never largely affect the eccentricities and inclinations of their orbits; and that the peculiarities of the Jovian system were due to the near approach to commensurability of the mean motions of Jupiter and Saturn. Further developments of these theorems on planetary motion were given in his two memoirs of 1788 and 1789. The year 1787 was rendered memorable by Laplace's explanation and analysis of the relation between the lunar acceleration and certain changes in the eccentricity of the Earth's orbit: this investigation completed the proof of the stability of the whole Solar System on the assumption that it consists of a collection of rigid bodies that move in a vacuum under mutual gravitational attraction. Laplace took an interest in the affairs of the French Revolution. He was appointed to a general committee of weights and measures, consisting of a roster of scientific luminaries including Lagrange and Lavoisier, which in 1791 recommended a standard of length equal to one ten millionth of the length of a quarter meridian (the distance between the north pole and the equator along the earth's surface). The committee was dismissed after Robespierre assumed power in 1793. In 1795, Laplace was reinstated in a reconstituted committee, minus Laplace's former research partner, Lavoisier, who a year earlier had met a sad end at the guillotine. This committee assisted in the implementation of the standard meter based on its previous recommendations. The same year, Laplace presented a copy of Exposition du Système du Monde to the "Council of 500," the lower house of the legislative body of the French government. He was an instructor at the Ecole Normal, a short-lived teacher training school instituted by the revolutionary government, and went on to teach at the Polytechnic School, established in 1794. In 1796, Laplace completed a general explanation of the phenomena regarding the theory of gravitation and solar system, Exposition du système du monde, but omitted the mathematical details. The work contains a summary of the history of astronomy. This summary procured for its author the honor of admission to the forty of the French Academy. It is commonly esteemed as one of the masterpieces of French scientific literature. The nebular hypothesis was enunciated here. According to this hypothesis, the solar system started as a globular mass of incandescent gas rotating around an axis through its center. As it cooled this mass contracted and successive rings broke off from its outer edge. These rings in their turn cooled, and finally condensed into the planets, while the sun represents what is left of the central core. Since Laplace, many scientists have called into question the ability of this hypothesis to explain the origin of the solar system. The idea of the nebular hypothesis had been outlined in 1755 by the philosopher Immanuel Kant, who had also suggested meteoric aggregations and tidal friction as causes affecting the formation of the solar system. When Napoleon assumed power in 1799, Laplace appealed for and received a position as interior minister, but, his personality not being up to the administrative and diplomatic tasks the position entailed, he was soon dismissed. Although Laplace was removed from office, it was desirable to retain his allegiance. He was accordingly installed in the senate and later raised to the position of vice chancellor, and then president, of that body. Laplace now set himself the task to write a work which should "offer a complete solution of the great mechanical problem presented by the solar system, and bring theory to coincide so closely with observation that empirical equations should no longer find a place in astronomical tables." The result is embodied in Laplace's analytical discussion of the solar system given in his Méchanique céleste published in five volumes. The first two volumes, published in 1799, contain methods for calculating the motions of the planets, determining their figures, and resolving tidal problems. The third and fourth volumes, published in 1802 and 1805, contain applications of these methods, and several astronomical tables. The fifth volume, published in 1825, is mainly historical, but it gives as appendices the results of Laplace's latest researches. Laplace is sometimes taken to task for failing to properly cite the contributions of others that are contained in this work. Jean-Baptiste Biot (1774-1862) assisted Laplace in revising the manuscript for the press. Biot tells an interesting story. In 1803 he requested by letter a copy of pages of the unfinished manuscript. Laplace, in response, said that he much preferred the work to be known by the public in its entirety. Biot, in rebuttal, said that he was not the general public, but a mathematical specialist, and that he was much interested in the abstruse mathematical details that the manuscript must contain. Biot offered to check the manuscript for the press as he otherwise examined it. Laplace granted Biot's wish, and forwarded the pages to Biot, often meeting with him and discussing the changes along with other topics that Biot introduced in conversation. Later in his career, Biot showed Laplace a correction to a geometrical problem that remained unsolved by the famous mathematician Euler. Laplace examined Biot's manuscript, and immediately arranged to have it read before the French Academy. Napoleon, who was keenly interested in mathematics and was himself proficient in the subject, was at the reading, but his presence did not but for a short moment intimidate Biot, as none other than the famous Laplace had arranged for the presentation. After delivering the memoir, Biot was invited by Laplace to his study, and there the eminent mathematician uncovered unpublished works devoted to the very corrections that Biot had shared with the academy just a short time before. Biot said he observed a like generosity on the part of Laplace on many other occasions (Bidwell and Agnew, 1853). Biot says that Laplace himself was frequently unable to recover the details in the chain of reasoning in his work, and, if satisfied that the conclusions were correct, he was content to insert the recurring formula, "Il est aisé à voir" (It is easy to see). The Méchanique céleste is not only the translation of the Principia into the language of the differential calculus, but it adds details that Newton had not filled in. It is said that when Laplace presented a copy of Méchanique céleste to Napoleon, the emperor remarked, "M. Laplace, they tell me you have written this large book on the system of the universe and have never even mentioned its Creator." Laplace responded that he "did not need to make such an hypothesis." Napoleon then relayed this reply to the mathematician Joseph Louis Lagrange, who exclaimed, "Ah! that is a beautiful hypothesis; it explains many things." Thereupon, Laplace countered with this statement: "This hypothesis, Sire, does explain everything but does not permit one to predict anything. As a scholar, I must provide you with works permitting predictions." In this exchange, Laplace expressed the view that scientific theories need to have predictive power. On that basis, he argued against the mention of God in his book. By contrast, Newton, whose work he translated, took the view that the Creator works through the natural world, and thus the very laws of nature that give us predictive power originate from that Creator. In 1806, Laplace was given the title of Count of the Empire. To the third volume of the Mécanique céleste he prefixed a reference to Napoleon as the peacemaker of Europe, but in copies sold after the restoration this was struck out. In 1814 it was evident that the empire under Napoleon was falling; Laplace hastened to tender his services to Napoleon's adversaries, the Bourbons, and when they came to power he was rewarded with the title of marquis and appointed a seat in the Chamber of Peers. In 1812, Laplace issued his Analytical Theory of Probabilities. The method of estimating the ratio of the number of favorable cases, compared to the whole number of possible cases, had been previously indicated by Laplace in a paper written in 1779. An important result of his investigation is the derivation of the so called Laplace-Gauss distribution, which can be applied to the distribution of random errors in measurement, it being a more sophisticated tool than a simple average of the measurements to obtain the most likely result. This treatise includes an exposition of the method of least squares, a remarkable testimony to Laplace's command over the processes of analysis. The method of least squares for the combination of numerous observations had been given empirically by Gauss and Legendre, but the fourth chapter of this work contains a formal proof of it, on which the whole of the theory of errors has been since based. Laplace in 1816 was the first to point out explicitly why Isaac Newton's theory of vibratory motion gave an incorrect value for the velocity of sound. The actual velocity is greater than that calculated by Newton in consequence of the heat developed by the sudden compression of the air which increases the elasticity and therefore the velocity of the sound transmitted. In 1819, Laplace published a popular account of his work on probability. This book bears the same relation to the Théorie des probabilités that the Système du monde does to the Méchanique céleste. One of Laplace's last acts was a controversial one. The French government had instituted a law that would penalize the free press. In 1827 the French Academy of Sciences entertained a motion to oppose this law. The academy was deeply divided on the issue, and Laplace, who was its director at the time, voted against the motion, after which he resigned his post. Laplace died soon after his resignation on March 5, 1827. Laplace had a wide knowledge of all sciences and was a dominating force at the French Academy of Sciences. Quite uniquely for a mathematical prodigy of his skill, Laplace viewed mathematics as nothing in itself but a tool to be called upon in the investigation of a scientific or practical inquiry. Laplace spent much of his life working on astronomy, culminating in his masterpiece on the proof of the dynamic stability of the solar system with the assumption that it consists of a collection of rigid bodies moving in a vacuum. He independently formulated the nebular hypothesis and was one of the first scientists to postulate the existence of black holes and the notion of gravitational collapse. He is remembered as one of the greatest scientists of all time (sometimes referred to as a French Newton) with a natural phenomenal mathematical faculty possessed by few of his contemporaries. It does appear that Laplace was not modest about his abilities and achievements, and he probably failed to recognise the effect of his attitude on his colleagues. Anders Johan Lexell visited the Académie des Sciences in Paris in 1780-81 and reported that Laplace let it be known widely that he considered himself the best mathematician in France. The effect on his colleagues would have been only mildly eased by the fact that Laplace was very likely right. Laplace was not always right. He adhered to and defended the particle theory of light, which in his own lifetime and by people know to him was overthrown in favor of the wave theory of light. Some say that his defense of the particle theory prevented acceptance of the wave theory until years after it had been properly expounded upon by Thomas Young. However seriously he may have taken himself, Laplace could be very generous, and was not without a sense of humor. When Jean Baptiste Joseph Fourier was up for election as secretary of the French Academy of Sciences, Laplace was seen writing Fourier's name on two pieces of paper and putting them both into his hat, but taking only one out. He then told the company that he had placed a different name on each piece of paper, and the purpose of this exercise was so that, by selecting one and casting it as his ballot, he would not know which person he voted for. Everyone was aware, however, that he had voted for Fourier. Laplace also came close to propounding the concept of the black hole. He pointed out that there could be massive stars whose gravity is so great that not even light could escape from their surface. Laplace also speculated that some of the nebulae revealed by telescopes may not be part of the Milky Way and might actually be galaxies themselves. Thus, he anticipated the major discovery of Edwin Hubble, some 100 years before it happened. While he conducted much research in physics, another major theme of his life's endeavors was probability theory. In his Essai philosophique sur les probabilités, Laplace set out a mathematical system of inductive reasoning based on probability. One well-known formula arising from his system is the rule of succession. Suppose that some trial has only two possible outcomes, labeled "success" and "failure." Under the assumption that little or nothing is known a priori about the relative plausibilities of the outcomes, Laplace derived a formula for the probability that the next trial will be a success. where s is the number of previously observed successes and n is the total number of observed trials. It is still used as an estimator for the probability of an event if we know the event space, but only have a small number of samples. where d is the number of times the sun has risen in the past times. This result has been derided as absurd, and some authors have concluded that all applications of the Rule of Succession are absurd by extension. However, Laplace was fully aware of the absurdity of the result; immediately following the example, he wrote, "But this number [i.e., the probability that the sun will rise tomorrow] is far greater for him who, seeing in the totality of phenomena the principle regulating the days and seasons, realizes that nothing at the present moment can arrest the course of it." This intellect is often referred to as Laplace's demon—in the same vein as Maxwell's demon, an imaginary figure of atomic dimensions who sorts out molecules of different velocities in order to thwart the laws of thermodynamics. The hypothetical intellect described above as a demon does not come from Laplace, but from later biographers. If the coordinates of two points be (r,μ,ω) and (r',μ',ω'), and if r' ≥ r, then the reciprocal of the distance between them can be expanded in powers of r/r', and the respective coefficients are Laplace's coefficients. Their utility arises from the fact that every function of the co-ordinates of a point on the sphere can be expanded in a series of them. It should be stated that the similar coefficients for space of two dimensions, together with some of their properties, had been previously given by the French mathematician Legendre in a paper sent to the French Academy in 1783. Legendre had good reason to complain of the way in which he was treated in this matter. This paper is also remarkable for the development of the idea of the potential, which was appropriated from Lagrange, who had used it in his memoirs of 1773, 1777, and 1780. From the potential, which is a scalar function, meaning that its value can be defined by a single real number, the gravitational force acting on a mass can be determined for every point in space. Amongst the minor discoveries of Laplace in pure mathematics is his discussion of the general theory of determinants in 1772, and his proof that every equation of an even degree must have at least one real quadratic factor; and a number of proofs and innovations in the differential and integral calculus. Together with Thomas Young, Laplace is credited with describing the pressure across a curved surface, as set out in the Young-Laplace equation. In theoretical physics the theory of capillary attraction is due to Laplace, who accepted the idea propounded by Hauksbee in the Philosophical Transactions for 1709, that the phenomenon was due to a force of attraction which was insensible at sensible distances. The part which deals with the action of a solid on a liquid and the mutual action of two liquids was not worked out thoroughly, but ultimately was completed by Gauss; Carl Neumann later filled in a few details. In 1862, Lord Kelvin (Sir William Thomson) showed that if the molecular constitution of matter is assumed, the laws of capillary attraction can be deduced from the Newtonian law of gravitation. ↑ John Bowring. The Decimal System in Numbers, Coins and Accounts. (London: Nathaniel Cooke, 1854), 97-99. ↑ Ian Stewart and Jack Cohen. Figments of Reality: The Evolution of the Curious Mind. (Cambridge: Cambridge University Press, 1999). ↑ Laplace.Saint Andrews University, UK. Retrieved May 25, 2007. ↑ Sylvanus Urban, ed., Francis Arago. The Gentleman's Magazine and Historical Review (1857) 531. Anonymous. 1830. The Astronomy of Laplace. American Quarterly Review 7:255-279. Ball, R.S. 2001. Laplace, in The Great Astronomers: The Essential Library Edition. The Essential Library. 153-162. ISBN 1401017851. Bidwell, W.H. and J.H. Agnew, (eds.) 1853. Biot and Laplace. The Eclectic Magazine of Foreign Literature, Science and Art. 106-109. Bowring, John. The Decimal System in Numbers, Coins and Accounts. London: Nathaniel Cooke, 1854. Stewart, Ian, and Jack Cohen. Figments of Reality: The Evolution of the Curious Mind. Cambridge, UK: Cambridge University Press, 1999. Thomas, William J., et al., (eds.) 1856. Notes and Queries: a Medium of Inter-Communication for Literary Men, Artists, Antiquaries, Genealogists, Etc. 1:42.